Silvina Tonarelli, M.D., Assistant Professor and Assistant Clerkship Director in the Department of Psychiatry, recently completed the nationally renowned Leadership Education and Development (LEAD) fellowship program. Last month, Silvina Tonarelli, M.D., completed the nationally renowned Leadership Education and Development (LEAD) fellowship program. LEAD is a one-year intensive program in educational leadership designed specifically for professionals in academic medicine. Those invited to participate in the cohort-based program learn how to practically apply leadership theories; understand the complementary roles of leadership, administration, and management personnel; lead through behavior modeling (e.g., creating a shared vision, encouraging professional development among team members, and supporting effective change); accept and apply feedback to personal and professional development; and cultivate professional relationships to achieve career aspirations. 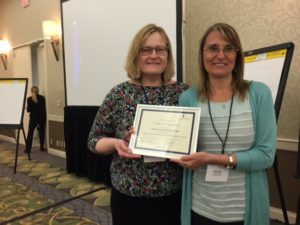 Dr. Tonarelli, who is an Assistant Professor and Assistant Clerkship Director in the Texas Tech University Health Sciences Center El Paso Department of Psychiatry, was recognized at the 2017 meeting of the Southern Group on Educational Affairs (SGEA) in Charlottesville, Virginia for her accomplishment. LEAD was created in 2009 to prepare professionals in medical education for leadership roles. The program’s curriculum focuses on four skill areas: 1) leading through strategic vision and setting direction, 2) leading by developing others, 3) leading by managing effectively, and 4) leading by developing the organization. Since its inception, the program has graduated nearly 100 educators. LEAD is sponsored by the Association of American Medical Colleges.